Hello from Blue Plum, Tennessee! Ardis, Geneva, and T.G.I.F. and I are celebrating this month – and for the next four – because our new book will be out January 1st. Each month we’ll tell you about a book in the series and we’ll give away a copy. I'll start us off with Last Wool and Testament. Let me tell you how it all began . . .
I’m a textile preservation specialist and I believe in chemical analysis, fumigation hoods, and useful things like wiping out weevil infestations. Not the pitter-pat of paranormal feet. I came back to Blue Plum to bury my dear grandmother and settle her affairs. Granny’s death was a shock. She was eighty, but she was still running her own business – The Weaver’s Cat – and living alone in her house on Lavender Street where she had her looms and dye pots. And after all these years, she’d finally started weaving her Blue Plum tapestry. It was going to be her masterpiece, all her love for Blue Plum woven into one picture. Members of Thank Goodness It’s Fiber (T.G.I.F. – the group for fiber artists Granny started) held a small wake for her at The Weaver’s Cat after the burial. Everyone there wore something made from yarns Granny dyed or cloth she wove. It was a lovely, touching tribute. Which brings me back to the ghos . . . the spir . . . that-in-which-I-really-do-not-want-to-believe. Can anyone please tell me why, on top of everything else I’m dealing with, I suddenly have a depressed ghost on my hands? Counting up from 1 to 6! 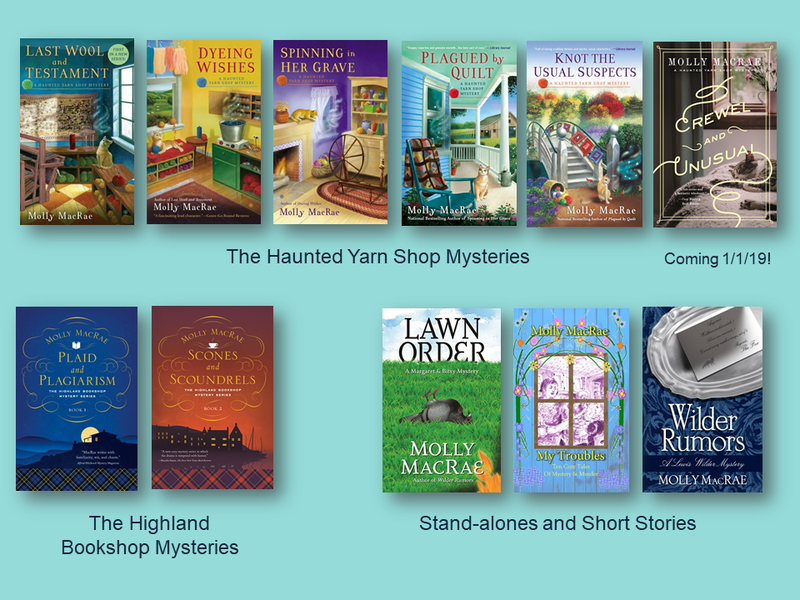 Five months of giveaways celebrating the release of Crewel and Unusual, book 6 in the Haunted Yarn Shop Mysteries, on January 1, 2019. Leave a comment and your email address by midnight August 25th for a chance to win a copy of Last Wool and Testament. Do you already own a copy? That’s okay! Win another and give it to a friend. Great post and idea. Fun to countdown with you! Thanks for the chance to win! Thanks! And thanks for stopping by today. What a great sounding series! Thank you for the giveaway! I haven’t read this series yet. Thanks for the chance. Ooo, sounds like good fun! Thanks for stopping by, Libby! I had to read the title twice. Pretty funny. I would love to read it. As for the ghost, it would be better if at least it wasn't depressed, right? You're right, Grandma Cootie. I'll have to see what I can do to help her out of the blues. It is I who thanks you for such kind words! Thanks for stopping by, Celia, and good luck! I am too, Jana, beside the obvious (that she's dead). The poor thing is pretty dismal. I don't think I've ever read about a depressed ghost. I certainly never expected to meet one. Thanks for stopping by, taurus! I haven't read this series yet, but it sounds like an awesome series. The depressed ghost sounds really interesting. If you get the chance to read the books, I hope you like them, Diane. Thanks for stopping by! Thank you, Autumn! Good luck in the drawing! Thanks for the giveaway. Sounds like a great series. You're welcome, Gloria. Thanks for stopping by! I think you might be onto something, Nancy. Mysteries upon mysteries. Thank you, Eileen! And thanks for stopping by. Sounds like a fun series for me to try. Loved your alternate meaning for T.G.I.F. If lucky enough to win a copy I look forward to passing it on to my local library so that others can discover the series. Thanks, so much, Neena! I love the way you show library love by passing books along. Thanks, Doward! You're a dear and loyal reader - generous, too. Showing library love is a great thing to do! Really clever title! Thanks for the opportunity. Thank you! And thanks for stopping by today! What fun. I'm glad I'm not the one dealing with the depressed ghost. Life has certainly taken an interesting turn. Thanks for stopping by the blog! That's a comforting idea, Dianne. Thanks for stopping by today! Sounds like a great series, I would love to win and find out the answers. "Last Wool and Testament" sounds amazing and I know I would really enjoy reading it. Thanks for the chance to win a copy. <3 Well, the whole series does as far as that goes. I would love the opportunity to read the whole Haunted Yarn Shop Mysteries. That's a terrific theory, Kay! I really like that idea. Thanks for stopping by today. Such a kind reader, Robin Coxon! And I love hearing that! Thanks for stopping by (and being patient). Many thanks! We're so happy to be coming back in Crewel and Unusual! Hi, I'm not entering since I have this book in Kindle and paperback and I want to enter the upcoming giveaways for the ones I might not have. I was just wondering why the cover of the newest book is going to look so much different. I love the covers of the previous 5 but 6 well, not really. I know it won't affect the story but I was just curious and hoping the other covers weren't going to change eventually as well--if so I better grab them now. Thanks! Hi Tari, the cover is quite different. The next two books are coming from a different publisher - Pegasus rather than Penguin - hence the change in cover art. The original covers won't be changing. Thanks for asking! So thrilled that book 6 is coming out in January! I love you're writing Molly! Every series that you do is exciting, and keeps you on the end of your seat till you're done your book. Cool! I hope you get the chance to read the books. Thanks for stopping by! Thanks, Martha! Be sure to stop by next month to hear about book two in the series! So glad you think so, Carole! Congratulations, Neena Luciow! You won the copy of Last Wool and Testament. Enjoy! I know it’s over I’m glad I saw this it looks great. Thanks, Donamae! We'll be back with a giveaway on the 23rd of September, October, November, and December. Stop by!